Mini pizzas. They were a staple on Saturday nights when I was kid. 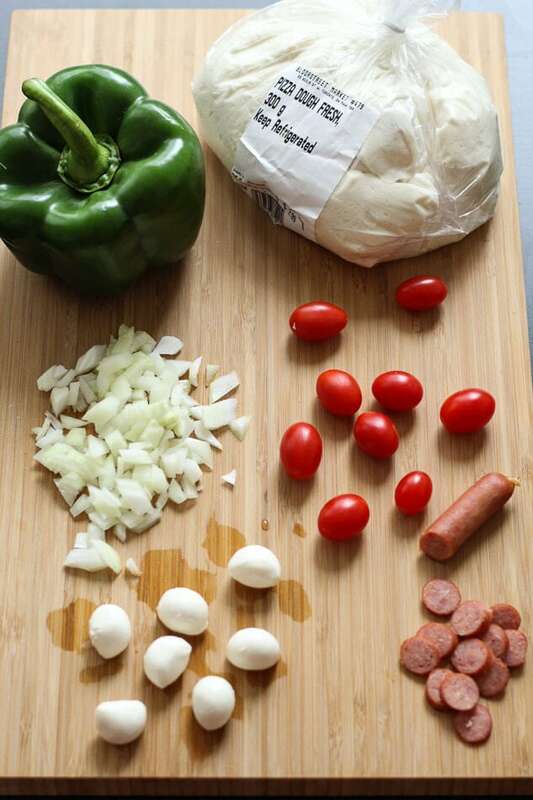 My mom and dad would cut up all of my favourite toppings-usually a mix of mushroom, green pepper and onions-and then I would slather English muffins with tomato sauce, mozzarella cheese and a ton of veggies. As an adult, I love to replicate recipes that my parents showed me how to make. 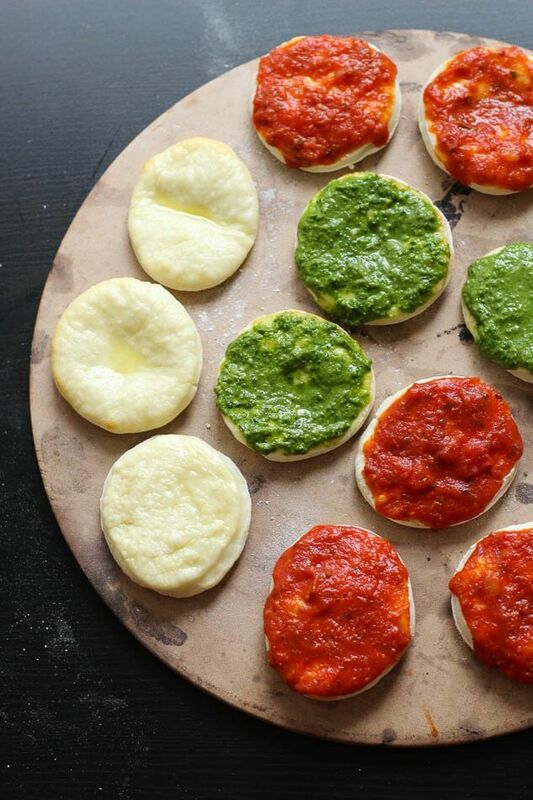 These Party-Friendly Mini Pizza Bites are the perfect injection of childhood fun for a grown-up get-together. Everyone gets to have a taste of what they like, and they are great in that they cater to everybody's dietary restrictions in a no-fuss manner. I have to say that one big flaw with my parents' pizza was the fact that we were using English muffins. If they weren't toasted beforehand, they would get all soggy and mushy, or they would become too crisp and just be too far from what a pizza crust should be. In fact, whenever I make a pizza with anything but a traditional dough, I always feel like I'm compromising in some way or another. I have pizzas on pitas during the week when I need a quick dinner, but a pita just doesn't mimic a crunchy, crisp crust. This is where the pizza dough comes in. Nathalie suggested I try a cookie cutter on the pizza dough and my life literally changed. The result was small, equally sized pizzas, with the same crunch and flavour as a traditional pizza. We've discovered that the best way to make pizza in the oven is to heat the oven as high as possible (around 500 degrees), and heat the pizza stone up in the oven with the pizza so that you end up with a crisp, pizzeria-style pizza crust that is crunchy and fresh tasting. I made four different kinds of Mini Pizza Bites: Red pepper, red onion & pesto; Pepperoni, mushroom & green pepper; Pizza Blanco with arugula & prosciutto; and Margherita-style with bocconcini cheese, cherry tomatoes & fresh basil. These are just some of my fave pizza flavours and it's really up to you to customize your pizzas how you like them! I personally just looove variety and having ton of options is important to me with any sort of cuisine. Will you be trying these Mini Pizza Bites? We guarantee these will be a hit at your next party! 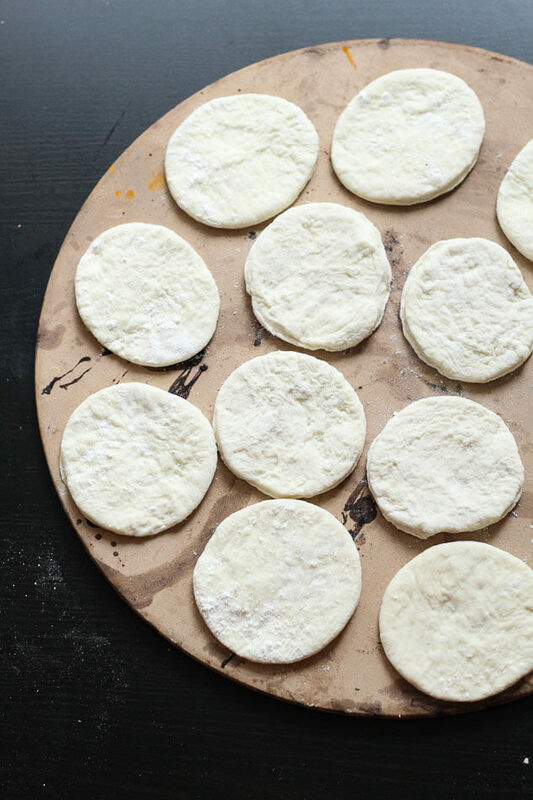 On a floured surface, roll out your pizza dough so that it is about 1/2 an inch thin. You want it to be pretty thin because it will puff up in the oven! 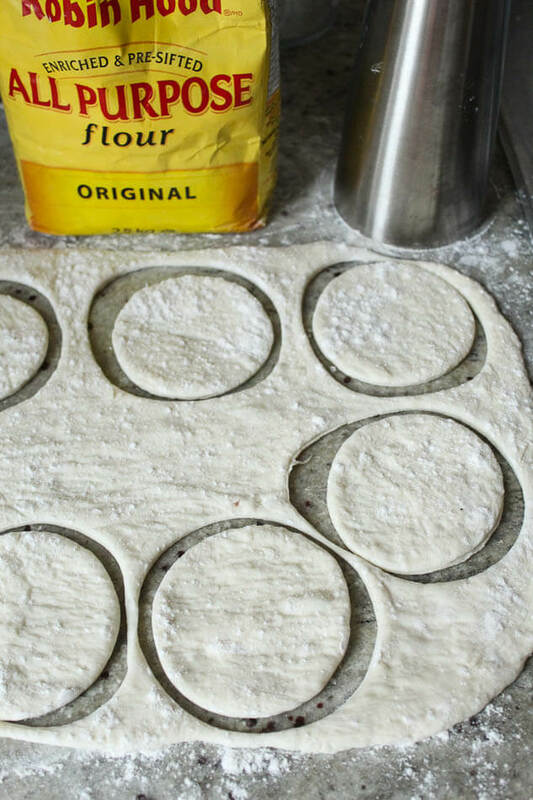 Use a stainless steel cup, glass cup or circular cookie cutter to create the same size circles of dough. You should be able to cut about 8 or 9 before you have to roll the dough up again to cut more. To get the dough to stick together again, run it under water just to get it wet enough so that it's sticky again, and roll it back out with some flour. Repeat with the cookie cutter, and you should end up with between 12-14 pieces of dough total. Take the pizza stone out of the oven, and place each little circle of dough onto the pizza stone. They will start to cook right away so place the whole stone into the oven right away and let the dough cook for 7-8 min. Meanwhile, make sure all your toppings are ready and cheese is grated. Take the dough out of the oven (making sure it's slightly crisped on top and bottom). Top dough with sauce, olive oil, pesto or whatever base you would like. Add cheese and toppings and put back in the oven for another 10-12 minutes, watching closely. Once the cheese is melted to your heart's desire, remove from the oven. Thank you so so much for sharing this! My husband and I use to make mini pizzas, but I forgot all about that option until now:) Will definitely start making them again with your improvements! Hahaha awww thanks Brittany!! I guess you could say this is the grown up version of mini pizzas 😉 Thanks for stopping by!